Finn is one of the new protagonists for the new Star Wars trilogy. His character is a Storm Trooper that rejects his place with the First Order, only to have to confront it when he comes into contact with Rey and Poe Dameron, a Resistance X-Wing pilot. Originally known only as the Stormtrooper designation of 'FN-2187', he was re-named Finn by captured pilot Poe Dameron during their daring escape from Kylo Ren's command ship. 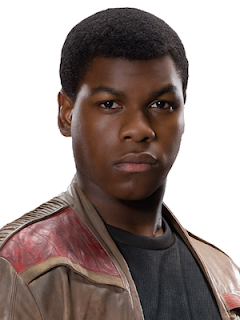 Boyega proved to be quite the actor, pulling off both earnest and comedic qualities very well for some great laughs and a heroic effort against Kylo Ren with Luke's saber. "I was raised to do one thing. But I've got nothing to fight for." "You don't know a thing about me, what I've seen. We all need to run!" To Captain Phasma "The name's Finn and I'm in charge now"
"I never should have rescued you!" "We go back to Jakku, we die"
"Stay low and put up the shields"
"I'm getting pretty good at this!" - said as Finn shoots down another TIE fighter whilst in the gunner seat on the Millenium Falcon as he and Rey are trying to escape Jakku. "I'm a Big Deal in the resistance." Finn: asking about what they should do with Captain Phasma - What should we do with her? Han Solo: Is there a garage chute... or trash compactor? Finn: What about that ship? Finn: The garbage will do! The garbage turns out to be the Millennium Falcon! The fast hunk of junk in the galaxy! Want more quotes from The Force Awakens? Check out what Han Solo and Kylo Ren had to say.